Posts categorized "Jesus: He Lived Among Us"
The Voice of the Martyrs created JESUS: He Lived Among Us for use in hostile and restricted nations where Christians are persecuted for their faith. But we also wanted to make the video available to our readers and other Christians in the United States, to enrich their understanding of persecution against even the earliest Christians. VOM reader Shirley D. recently shared about her experience with the video, specifically how it affected her granddaughter, 5-year-old Rylee. As they watched the film, Rylee was completely absorbed in the story of Jesus. But after the movie, she wanted to be alone. She was sad because of the suffering that Jesus endured. Shirley gently explained that Jesus willingly endured the pain, paying the price for our sins so we could be saved and have a relationship with God. Deeply touched by the story of Jesus as told through the video, Rylee made the commitment to follow him fully. She then prayed with her grandma, asking God to forgive her sins and to help her live for him. Once we were through, Rylee gave me a beaming smile with her eyes sparkling—there was no doubt she had felt the presence of the Lord! She ran off happily, then suddenly stopped and turned around, and ran back. “Grandma,” she said, “can I hug you?” And she gave me a big, long hug! What joy to have the privilege of sharing that wonderful life-changing experience! Praise the Lord for little Rylee and her openness to the Good News! We pray that many more souls, in hostile and restricted nations and in the United States, will be presented with the life-changing story of Jesus’ love through this animated video. You can ORDER your own copy of Jesus: He Lived Among Us to show to your family and friends by clicking here (both English and Spanish included on DVD). You can also help SUPPORT VOM’s efforts to translate and distribute the film into hostile and restricted nations. Thank you for standing with VOM as we spread the Good News! 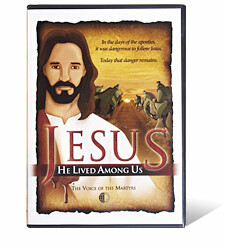 Today I am very happy to share with you that The Voice of the Martyrs is offering a FREE DVD of the new animated JESUS: He Lived Among Us movie for your church. Our goal is to reach 100,000 churches with this message. Will you join us today by signing up your church to receive a free copy of this 90 minute DVD? It's easy, all you have to do is click here and sign up. In this 90-minute animated video, the story of Jesus unfolds through the eyes of his last surviving disciple, John the Beloved. Banished to the Island of Patmos, John recounts the incredible and often dangerous story of what happened when Jesus lived among us. Viewers are sure to be inspired by this extraordinary retelling of the life of Jesus. The video will soon be available in more than a dozen languages, and church leadership will be provided information on how to obtain free duplication rights for evangelistic purposes. Register your church to receive a FREE DVD. Never before has such an offer been made available!